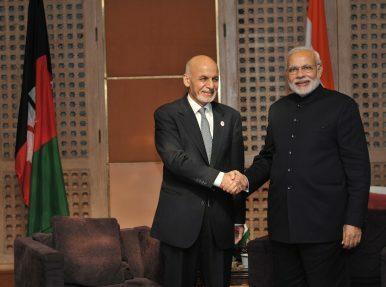 The U.S. president might find it interesting to learn just what India has done for Afghanistan. “I get along very well with India, Prime Minister Modi. But… he is constantly telling me he built a library in Afghanistan. […] That’s like […] five hours of what we spent [in Afghanistan]. […] I don’t know who is using it.” So declared U.S. President Donald Trump on January 3, 2019. That was just one spoonful in a jar of errors and disrespectful opinions that the president recently served in his statements on Afghanistan. Trump also claimed that the Soviet Union had invaded Afghanistan to fight terrorists, that the USSR collapsed because of the failed Afghan war, and that countries like India do not do enough for the mountainous country. None of this is true. The thing is: India has actually helped Afghanistan in a number of ways ever since the Taliban were pushed out of power in 2001. A part of a much broader assistance included building many objects. But, to my knowledge, a library was not one of them. So here are some of the major projects realized, in one form or the other, by India in Afghanistan – and I am counting only the completed ones: (1) the building of Afghanistan’s Parliament in Kabul (the complex includes a library, so in that sense India did build a library in the country); (2) the restoration of the Stor palace in the same city; (3) rebuilding of the Habibia High School, also in the capital, and providing it with grants-in-aid; (4) reconstruction of the Salma dam, now known as the Afghan-India Friendship Dam; (5) The establishment of an electricity transmission line from Pul-e-Khumri to Kabul; (6) reconstructing the Indira Gandhi Institute for Child Health/Indira Gandhi Children’s Hospital in Kabul (which had also been built with India’s help decades ago) and supporting it in many ways; (7) financing the establishment of the Afghan National Agriculture Sciences and Technology University (ANASTU) in Kandahar and assisting it in various ways; (8) constructing the Chimtala power substation in Kabul; (9) building the cricket stadium in Kandahar; (10) building a cold storage warehouse in the same city; (11) upgrading telephone exchanges in some provinces; (12) expanding the national television network; (13) digging tube wells in some of the provinces; (14) reportedly rehabilitating three water reservoirs; and (15) establishing five toilet and sanitation complexes in Kabul. This is not to say that India is behaving like a complete charity. New Delhi has obvious, vital interests in Afghanistan, including the urge to counter Pakistan’s influence there and secure Kabul’s friendship in the process. The (16) Zaranj-Delaram road, for instance, is strategically important not only for Afghanistan, but also for India. It connects the border town of Zaranj with the city of Delaram, thereby establishing better communication between the Iranian border and Afghanistan’s most important transport avenue, the Ring Road (which links the country’s biggest cities and passes through Delaram as well). As landlocked Afghanistan is very dependent on transit through Pakistan, such infrastructure elements make other options easier: in this case, a part of Afghan transit can pass through Iran. This is something both the government in Kabul and New Delhi are happy about. In a grander scheme of things, the Zaranj-Delaram road will become a part of a developed infrastructure chain that will reach from Iran’s Chabahar port to Delaram. The construction of the road was financed, completed, and partially protected by Indian institutions. Similarly, the India-supported Shahtoot dam project, if realized, may result in stopping more Kabul River waters in Afghanistan, reducing the amount flowing downstream to Pakistan. And all of this is a tip of the iceberg, as India has realized or is realizing (17) hundreds of smaller, less visible and harder to trace projects, including community development ones. The completed ones include dozens of schools and basic health clinics: check the report here for lists and maps. (I can’t find a library there.) Even here, however, charity meets pragmatism: the large projects were often realized in the area of the capital or the safer northern and western parts of the country, while many of the small projects were earlier spread across the Pashtun borderlands, thereby directly challenging Pakistan’s influences in this zone (see also the map in the report linked above). Moreover, construction is only part of the cooperation. New Delhi has also gifted (18) hundreds of buses for the Kabul transportation system; (19) 285 military vehicles for the Afghan National Army; (20) Mi-25 and Mi-35 choppers for the air force; (21) 10 ambulances for public hospitals in five cities; (22) Airbus aircraft for the national airlines; (23) materials for substations and a transmission line in the Faryab province; (24) high protein biscuits for Afghan schoolchildren; and (25) shipments of wheat and pulses. India is also providing (26) funds to an Afghan Red Crescent Society program; (27) free medicine and medical consultations in its medical missions in five Afghan cities; (28) Afghan public institutions with technical advisers; (29) training for Afghan public servants; (30) policemen; (31) soldiers; (32) hundreds of scholarships for Afghan students; vocational courses for (33) Afghan youth; (34) Afghan women; and (35) tele-education courses. New Delhi even (36) lets Afghanistan’s national cricket team use an Indian stadium as its home ground. Shall I go on, President Trump?